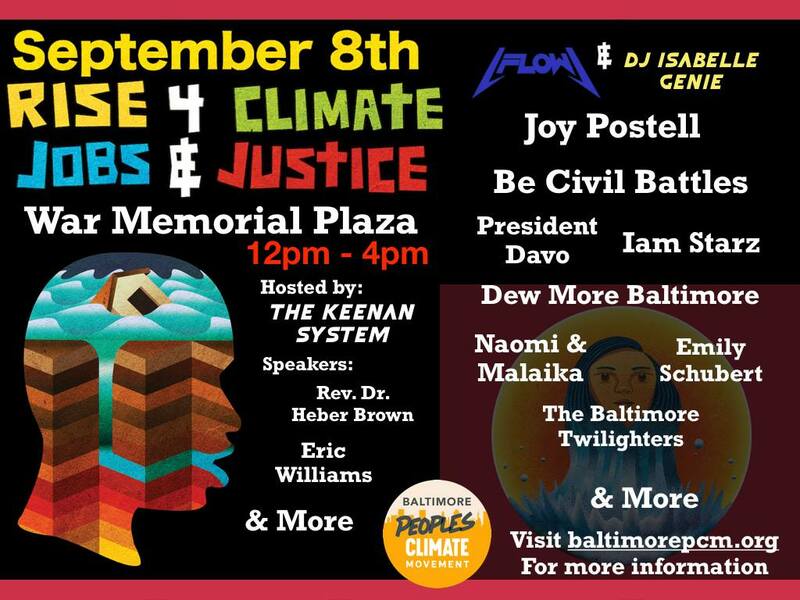 Join the Baltimore Peoples Climate Movement for the Festival for Change: Climate, Jobs & Justice featuring art, performances, and opportunities to take action for climate justice. On September 8, thousands of rallies will be held in cities and towns around the world to demand our local leaders commit to building a fossil fuel free world that works for all of us. The Festival for Change: Climate, Jobs & Justice will be a space for celebration and community building as we gather together to build a more just and sustainable future in our city. A FREE event for all Baltimoreans at War Memorial Plaza with activities, games for kids & adults, live music, and DJ. Learn how to garden and compost in your community with Filbert Street Garden, Baltimore Compost Collective, Dayspring Garden, and Compost Cab. Lean how to make cider with the Baltimore Orchard Project. Visit Echotopia's Herb & Native Flower Seed station to help harvest aromatic herbs and native flowers. Take home some herbs with beneficial properties and seeds for immediate planting! Join Navitas Solar for solar panel demonstrations. Learn how you can go solar without putting panels on your own roof with Neighborhood Sun. Join the Fight for $15 Coalition to help create a collaborative art piece called "Why I Fight for $15" and write a letter to your elected officials. Learn more about climate justice while playing this classic game with a climate spin! Test your knowledge of what can and cannot be recycled in Baltimore City with this interactive game and learn more about reducing waste with Baltimore Beyond Plastic. "TEETERING X TOTTERING (ON THE BRINK)"
Check out this kinetic sculpture by Laure Drogoul, made from wood, repurposed plastic bottles and water that invites the participants to level and stabilize themselves using the shared water in the sculpture as a balancing mechanism. Through movement the work creates a relationship between the participants and creates an experiential awareness of water as a shared resource. "LET'S MEET AGAIN IN 2032 (UNLESS EITHER ONE OF USE ARE DEAD)"
Stop by Hugh Pocock's installation to receive an invitation to a picnic that will occur in 2032. At the picnic, people will discuss their lives and the events that have taken place since 2018. Many of these will be about the rapidly changing climate and what will have happened between then and now. Pose for a photo in front of a beautiful hand-painted backdrop about wind power by Alex Dukes, Di’amon Fisher, Grace Marshall, Naomi Wilkins, Stephanie Wallace, and Torianne Montes-Schiff.